The Arrival tells the story of a man who must leave his home and family and travel to a new place where everything is different. 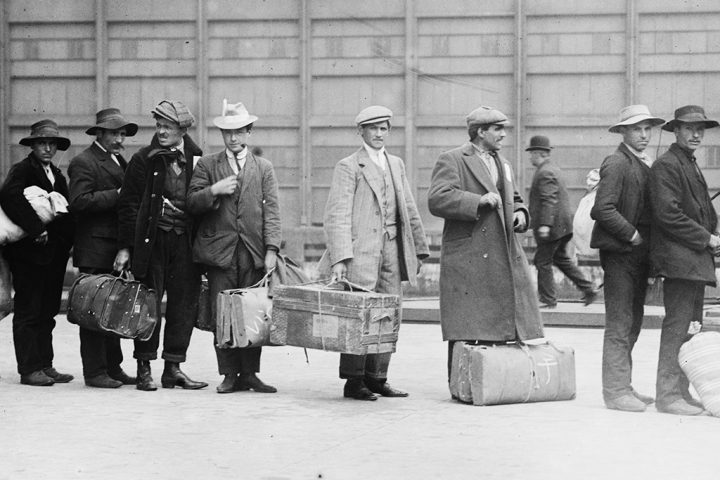 as the artist Shaun Tan was creating the book, he tacked up several photographs from Ellis Island in the early 1900s for inspiration. Today, immigration is a big subject both in the united states and across the globe as refugees search for new homes where they can live, work, and raise a family. If you had to leave your home on a long journey, what would you pack in your suitcase? Visit Ellis Island on this interactive tour! Shaun Tan uses no words to tell his story, instead he uses visual storytelling techniques that are seen in comics, movies, and design to give the reader all the information they need. Some drawings are like wide camera shots or close ups. Some pages are broken up into several frames to show the progression of a moment. In adapting the book to the stage, Orange Grove dance used similar techniques to create the place, story, and most importantly, the feelings in the book. everyday, we use words to communicate with each other, but we use so many other things as well. What are some ways you communicate without words? Want to create your own wordless story? Try it here at Strip Generator!